These are beautiful chairs--lovely details. They are sturdy without being too heavy. They are more beautiful in person. They pair nicely with the Coco accent table. 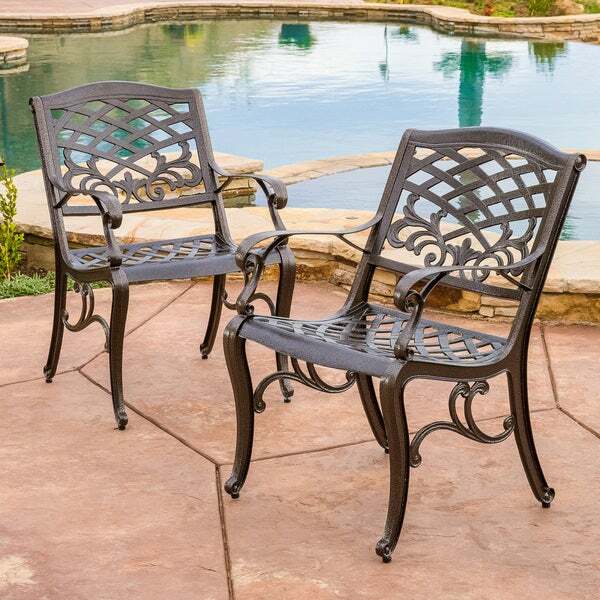 These outdoor chairs are made of durable cast aluminum that holds up to outside weather conditions. These bronze chairs have a neutral color that goes with any outdoor decor. Use these chairs around your outdoor dining table, by the pool or on a patio. With their mesh backs and comfortable seats, these chairs work wonderfully for any of your outdoor seating needs. We are a local small business with an outdoor space that gets moderate daily traffic and use by clients and employees. These are a great addition to the dining C. Knight set we purchased. The quality is better than expected, everything seems sturdy and was easy to put together. It's much more comfortable than one would expect- especially since we have opted not to use pads or cushions. Absolutely satisfactory. Really should be 4 1/2 stars, nice product. I purchased these "additional" chairs to match the outdoor table & chair set I previously purchased. About 2 weeks prior I had purchased another set of these chairs but because 4 of the 8 pieces had issues, (scratches and warped pieces) I returned the set. Customer Service gets 5 stars for handing this! Moving forward the second set was great. One suggestion is to hand tighten all the nuts first, set the chair on a level surface and then tighten the bolts. Also use your own wrench as the one enclosed is thin one that leaves a bit to desire. Enjoy, still a highly recommended product. Can’t say enough good things about these. They’re really well made. Feel very sturdy. We use around fire pit and even the big guys find it comfy. We don’t even use cushions on them. Highly recommend. This set of chairs is very attractive. The color is bronze as pictured. They went together easily, although they were missing some washers, which we were able to pick up. They are not heavy, as they are made from aluminum, but very sturdy and comfortable. The seating area is wide and pulls you back into the backrest. I'm sure they will last a long time. I like them so much that I want to order some more Christopher Knight furniture. Loved the way these looked on line. I assumed they would match the floral blossom table since they were the same company and same color. They were darker, more textured and more shiny. They are a beautiful design though. Construction would have been easy except some of the nuts, bolts, etc had been lost in shipping. We had to take the few remaining ones to the hardware store to match the missing ones. Also, two of the four chairs seemed warped and no amount of leveling would make them sit straight. They are comfortable, and good looking, but they were not 5-star because of the problems we had. irrespective of a product we choose or the way we behave. These beautiful bronze powder-coated chairs are accurately represented in color, design and quality, as displayed. I am very pleased with the chairs and other matching items that I purchased in this suite of outdoor furniture. 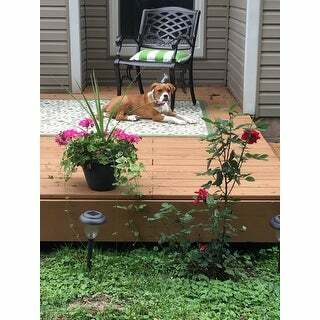 Go ahead, dress your deck or patio with fine jewelry, then humbly accept guests' compliments and sitting pretty yourself. . 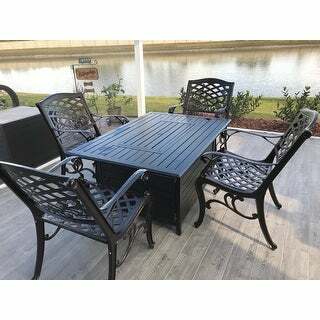 I purchased these chairs to go with a small slate top table for our deck. Not a perfect match as the table has cast iron legs but still looks nice together. Very comfortable for this type of material. Love the wider bottom seat and perfect for outdoor use. Not heavy like iron as they're aluminium so very easy to move around. And they look elegant. Several years ago I bought a cast aluminum table due to my glass table being broken. 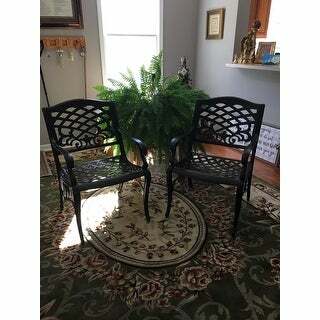 I liked the beauty and sturdiness of the cast aluminum table so have been looking for chairs. This summer I found what I was looking for at Overstock. So glad I found them. The chairs go great with the table and are comfortable. I bought these 2 chairs to match my dining set and glider, so I can use them with either. They are an exact match to my dining set chairs. They're sturdy and very comfortable without cushions. It did take some time to put them together. Even though the instructions suggest 2 people assemble them, I did it by myself without any problem. Strong, sturdy and easy to assemble. Look great too!! Bought 2 and then ordered 4 more. Look true to the picture. These chairs arrived quickly and in perfect condition. Assembly was easy and straight forward. They are sturdy and look great. Good price too! Purchased two extra chairs to go with my full 7 piece patio dining set. Love the set. Needed armchairs for elderly mom to use to stand up. Very sturdy and comfortable. Accent with floral lumbar pillows. They don’t need cushions. I’m very happy with the full set. Relatively easy to assemble. Look great in our front yard. More comfortable than you would think! I bought seat cushions, but will return them because I don't feel that they are necessary. My order and the ad clearly state aluminum BRONZE chairs but they are jet black and I see there are no options for such. I would return them but no substitute is available and I believe it would be at my expense,etc. Too bad as the chairs are good quality and arrived in good shape. So be warned these are not bronze color I was trying to match to other chairs I have. Fast shipping, great packing and easily assembled but can be done a bit faster with a 14mm ratchet wrench. Like that it had one extra of each bolt, nut and washers though I did not need them. My wife liked the looks of the first set around the fire pit so much that we ordered a second pair which also was shipped and assembled as fast and easily as the first. We love our new chairs - they are sturdy & look great on our patio! We will buy some seat cushions...but I think they’re comfortable even without cushions. Looking forward to a lot of time on our patio! Already had the chairs with attached table and loved it! We got another attached table and chairs as well as 2more single chairs. We have kept them uncovered through the winter and they still look like knew. 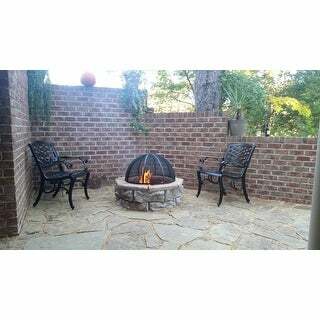 They are sturdy,comfortable and look great around our fire pit and koi pond. Highly recommend them! I purchased the set of chairs when I first moved into my condo to add to my patio. They are extremely durable and comfortable. "WHAT IS THE WEIGHT CAPACITY FOR EACH CHAIR PLEASE?" For the exact weight capacity, it seems like you should ask the manufacturer as I do not know the answer to this question. However in questions previously asked, it appears that someone has responded that their husband who weighs 350 pounds fits comfortably in these chairs. Thanks. The weight capacity is 275 LB plus. The chairs are very sturdy they will not fall or blow over in a storm. I am very pleased and happy with the great chairs I am heavy and I fit well and compfortable in the chair. I do have cushions on them. I bought these chairs because my grandson weighs over 300lbs. I am confident he will fit into these chairs whenever he comes around. I hope this helped you to decide what to do. I cannot answer exactly but I can tell you they are sturdy chairs with a wide, ample seat. My husband is 230lbs. and loves the chair. "I also have lost 5 of the bottom screw in bumpers to the chairs. My Knight set has 4 chairs in total. So 2 are unusable due to this problem. Please let me know how I can get replacements. Thanks." "Would these chairs somewhat match the coloring of Christoper Knight's Cozumel Copper Cast Aluminum bench?" "My husband weighs 350 lbs and is 6'6" tall. Would these chairs work for him? Esp. in the weight department?" These chairs are very sturdy and have a wide seat and back. My son-in-law is about the size of your husband although not as tall, and fits well in the chair. Hubby is 6'3" and similar in weight. He finds the chairs reasonably comfortable and definitely sturdy enough. He does want cushions. The chairs are very sturdy. I think it would hold his weight if he could fit in the chair. "There are 2 sets of Sarasota Cast aluminum Bronze outdoor chairs . $** for one set #16045028 , $** nfor the other set item #15994613 . What is going on ? Please enlighten me . Thank you !" Look closer at the chairs. The one with the item number #15994613 is an adjoining set. The are attached together. The other set is of individual chairs. "I bought these chairs and love them! where can I find cushions to fit?? these are an odd size seat, especially with the curve. Thanks!" "I would like to purchase the swivel chairs in this design, does anyone know where they might be available? I have looked at a lot of places on line to no avail. 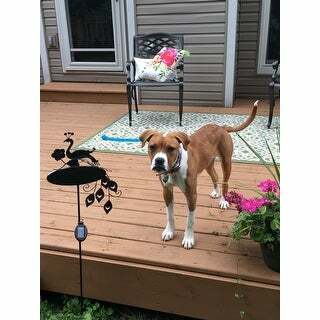 Thanks for your help in obtaining this information." I have no idea where you could purchase a swivel version of this chair. But since Overstock sent me an email asking me, I will say that these chairs - (I purchased two of them last summer (2016)) - are absolutely WONDERFUL! They are so handsome - so attractive - so elegant - very comfortable - weather resistant - sturdy - I couldn't recommend them highly enough. I'm so glad I bought them! They really "made" a certain corner of my garden (along with several rose bushes and other flowers and shrubs) - into a most attractive "nook" for friends to gather for Sangria and conversation. I hope to get more this coming summer. I hope Overstock will still carry them.